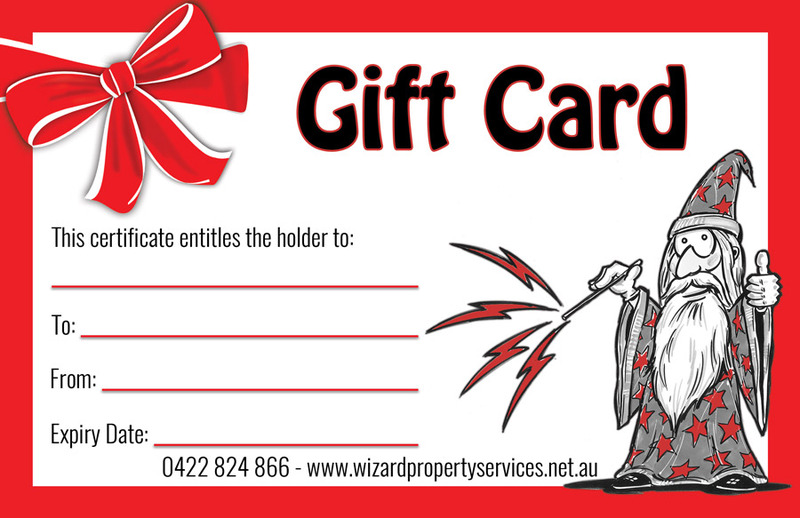 Wizard Property Services Gift Certificates are very popular among companies who want a thoughtful way to say ‘Thank You’ to their employees for all their hard work. Our certificates include all of the services listed below. For more details – please refer to our Services Page. Our minimum service time for our gift certificates is two hours. Please submit the gift certificate form with the details of the service or services you would like to give as a gift. One of our staff will contact you to provide you with a quote and our bank details, as soon as payment is received, an email containing the downloadable Gift Card Certificate will be sent to the recipient or yourself, which ever you selected. House Cleaning Vacate Cleaning Open House Cleaning Rental Inspection Cleaning End Of Lease Cleaning Bond Cleaning Window Cleaning Carpet Cleaning Pest Control Services Additional Services.